I admit, I hesitated. With so many pizza restaurants popping up all over the south land, how different can this one be? Let me just say, I bowed down to owner and visionary, Paul Hibler, who opened my eyes and my palates to the art of pizza! 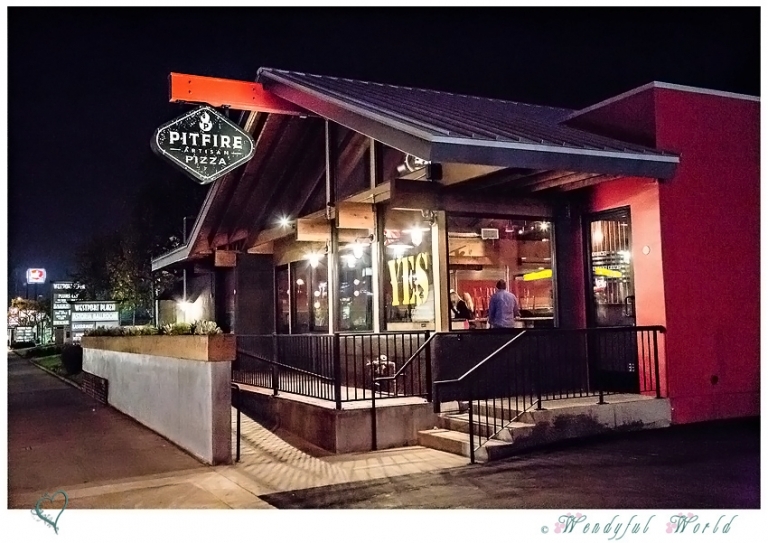 Although Pitfire Artisan Pizza is a chain restaurant, each location is unique – incorporating the culture and history of the community it’s located in. This one in Costa Mesa, for example, is nautical themed because of its proximity to the ocean and the surf and skateboard culture. All the decors from the brightly paint walls to the bar area with polished planks; the shining surfboard like counter top to the lights from the VW vans all embrace the community it aims to serve. Our night started with some pretty awesome drinks and cocktails crafted by the talented Chef Jason Neroni of Superba Snack Bar. From upper left to lower right, Jamaican Red Ale, House Lemonade, The Crystal Cove (vodka/pear nectar/elderflower liqueur/prosecco/lemon/rosemary garnish), The Flamin’ P (reposado tequila/jalepeño honey/pink grapefruit soda/mint), The Neroni (gin/aperol/antica vermouth/blood orange juice/mint), and The Duke (rye/maraschino liqueur/dried cherries/coke). While we chatted with old friends and meeting new ones, we sampled some tasty FLATBREAD & RICOTTA (Garlic Oil/Parmesan/Parsley Herb Ricotta/Dried Tomato & Olive/California EV Olive Oil). I had to stop myself from eating one after another because the real treat was soon to follow. Dinner officially started and Suki of Eat Suki Eat, Allen, and I had the best seats in the house – right in front of the signature red wood-fired kiln! Soon we were served a beautiful bowl of HAND-CRAFTED CHICKEN MEATBALLS (Roasted & Braised/Tomato Sauce/Grana/Grilled Bread). If you think they look pretty, they tasted even prettier! The meatballs were so tender and full of flavor. 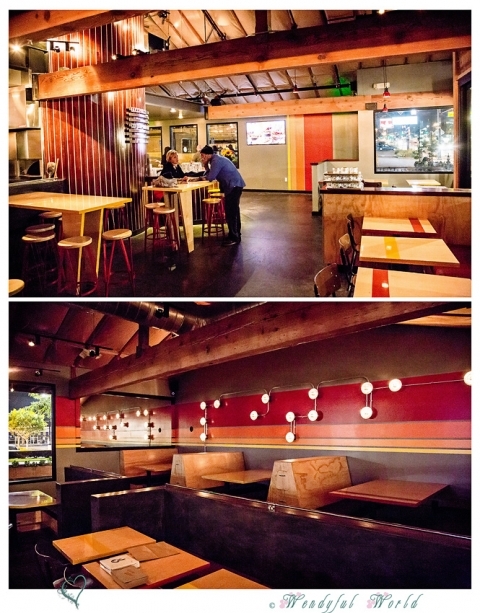 The first tray of Pizza was what made me realize Pitfire Pizza was no ordinary pizza restaurant. All of the pizza are around $10. I love the thin crust with a slightly thicker outer crust. The doughs are made in house daily and rest for 2 days before baking . Toppings are sourced either locally or from Santa Monica Farmers Market. THE BURRATA PIE (Tomato Sauce/Caramelized Onion/Burrata Cheese/Wild Arugula/Hazelnut/Pesto Drizzle) was light, fresh, and creamy, unlike most people that leave your hand and stomach heavy and greasy. THE SAUSAGE PARTY (Huntington Sweet Fennel Sausage/Tomato Sauce Fontina/Mozzarella/Red Onion/Oregano) is like a party in every bite! Definitely a meat lover’s favorite. I think this was a ‘Be An Artist’ pizza called TUSCAN PIE (Chicken/Potato/Red Onion). I thought it was quite interesting. Never thought I would love the ROAST PUMPKIN PIZZA this much! It was a bit sweet and a bit savory. Almost like a ‘dessert’ pizza. One of my favorite! The BRUSSELS SPROUTS & BACON was another favorite. Really, who doesn’t like bacon? It makes everything tastes better, even with brussels sprouts! The red pepper flakes and black pepper baked in gave this pizza a really nice kick. A closer look of all the pizzas! But there was more! I was so thrilled to see this plate of beautiful ROASTED PEAR SALAD (Roasted Bosc Pears/Dates/Ricotta Cheese/Pine Nuts/Mixed Lettuces/fig & Olive Vinaigrette)! It’s a simple salad but very satisfying. I would even eat this as a meal for the days I just want something light. This was a PANTRY PLATTER of (from left to right) Fall Squash with Honey and Mint, Roasted Brussels Sprouts/Garlic Parmesan Dressing Farro Salad with Roasted Mushroom and Hazelnuts, Kale with Golden Raisins and Pine Nuts served with Heirloom Beans. If you have a few people in your party, this will be perfect to share. Last entree of the night was LINGUINI BOLOGNESE (Spinach Linguini/House Made Beef Ragu). I probably didn’t do justice to this dish as I was completely stuffed and only took 1 bite. I know, I know. Did I eat the dessert? You betcha! Who could resist the JUMBO CHOCOLATE CHUNK COOKIE with ORGANIC VANILLA SOFT SERVE ICE CREAM topped with Guittard ‘de Oro’ Chocolate Sauce and crushed nuts? It was a perfect ending to a perfect dinning! We got a private tour to the kitchen on to this private banquet room with it’s own oven which was the original oven used when Pitfire started 15 years ago. 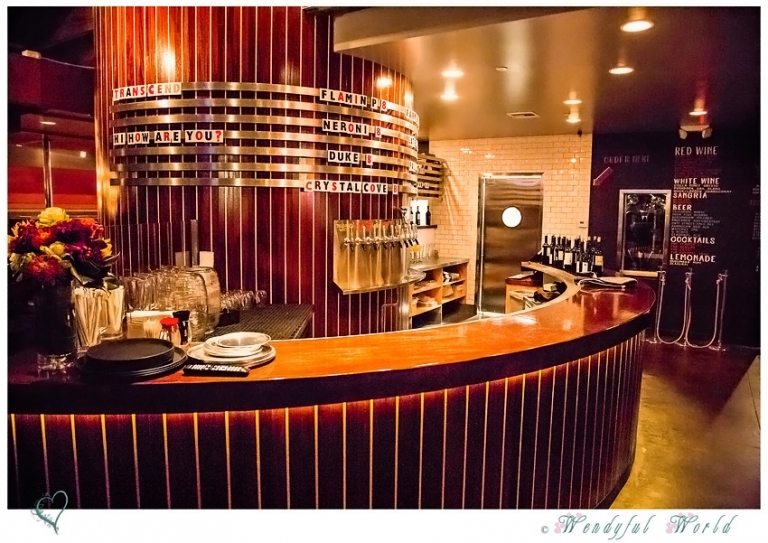 This is a perfect place for a birthday parties or special celebration. I was very touched by how much passion Owner Paul has for his restaurants and the communities the restaurants serve. Through his passion and innovation, I believe his restaurant will continue to grow. We also got a glimpse of what will be the future home of ‘Pie Society’ in the back of the restaurant. It is a cocktail lounge with very dim light that will be connected to the private banquet room. I can’t wait to see when it’s all finished. We were so stuffed by the end of the night and we didn’t leave empty-handed. All the guests got a pizza box with a T-Shirt and gift card. By far this was one of the best media events I’ve attended! Everyone was so warm and welcoming. Special thanks to Devon and Julianna of Wagstaff Worldwide, Inc and Pitfire Artisan Pizza and its entire staff for a wonderful dining experience! I can not wait to come back and be my own artist and create my own pizza.